Driven by a database of over 1 million swimming results. Filter swim meets and results by event, swimmer, club, stroke, distance or gender. Australian-owned and developed, SwimMate was designed by people who understand swimming in Australia. 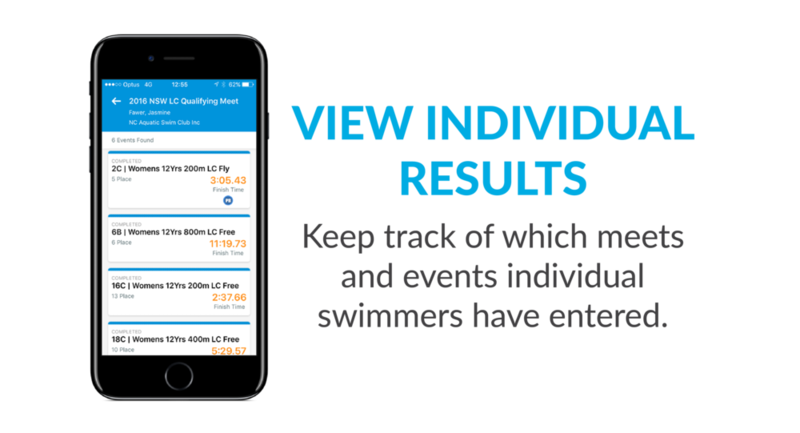 Never miss a medal or a PB with SwimMate’s live results service. Whether your pool-side, interstate or overseas, you can share in your mates’ or family members’ successes. View your results and future meet entries in one single list. Measure your performance and stay ahead of your competition - let SwimMate show you how close you are to achieving your next qualifying time. View a complete list of swimmers from the same club who have entered a meet. Keep track of which meets and events your swimmers have entered. Access real-time start lists, psych sheet rankings, meet timelines and programs (coming soon).